The latest iteration of the Nissan Pathfinder has arrived, and it is packed with even more versatility and high-tech Nissan features than before. With standard 7-passenger seating and V6 power, Nissan's latest Pathfinder is more than capable of transporting your family around Greensboro, North Carolina and well beyond. Refreshed and updated for 2017, the Pathfinder features a sleek new style and plenty of modern amenities. Shop at Vann York Nissan now to find a 2016 or 2017 Pathfinder SUV for your family to enjoy today. Browse our complete inventory of new Nissan Pathfinder SUVs near Greensboro or visit our dealership location in High Point, NC. Before your visit for a test drive, read below to learn why the new Pathfinder is a smart buy for families near Greensboro. Step inside the cabin of the new Nissan Pathfinder and you will discover a spacious 157 cubic feet of passenger volume, plus nearly 80 cubic feet of maximum cargo space. The Pathfinder's cargo area is highly flexible, thanks to its easy-folding rear seats. With Nissan's EZ Flex Seating System, the Pathfinder's seating for seven can quickly convert to additional cargo-hauling room. Every 2017 and 2016 Pathfinder SUV gets an array of convenience and comfort features like steering wheel mounted controls, adjustable front bucket seats, 60/40 split-folding rear seatbacks, reclining rear seats, remote keyless entry and cruise control. Nissan's available RearView Monitor backup camera makes navigating in reverse gear safer and more manageable. Nissan's 'VQ' 6-cylinder engine powers the 2016 and 2017 Pathfinder SUVs; the 3.5-liter V6 develops exceptional power and torque, no matter which model year you select. For 2017, the Pathfinder's 3.5-liter V6 receives upgraded power, now rated at 284 hp and 259 lb-ft of torque. To improve efficiency, power is delivered through Nissan's popular Xtronic CVT (continuously variable transmission). Front-wheel drive (FWD) comes as standard, but an All-Mode 4x4-i Intuitive 4WD system is an optional feature. 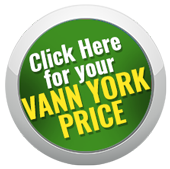 Drivers near Greensboro and High Point, North Carolina should visit Vann York Nissan to discover a new Nissan Pathfinder. If you shop for your new Pathfinder SUV here on the Vann York Nissan website before your visit, then submit an online credit application for your new auto loan. Our full-service dealership is also equipped with a Nissan auto service center for the future maintenance of your Nissan.